Greece is five times smaller than Texas. It is six times smaller than Turkey. And it’s more than fourteen times smaller than Indonesia! However, in spite of its size, the sheer number of awe-inspiring travel destinations can get overwhelming. With every step you take, you are reliving history. Every direction you look you will see intense beauty. Unlike other popular vacation spots, its landmarks cannot be seen on a series of daytrips. It will take years worth of vacations – or one very long sabbatical – to feel like you're even close to having seen everything. That’s not to say that a holiday in Greece should be a frantic rush from one historical site to another. On the contrary, you can spend a week or two in perfect comfort, experiencing the ancient country at your own pace. That’s really the best way to go about it. Pressure to do everything immediately always leads to a vacation that’s more education than pleasure. So, browse some villas in Greece with a private pool, and find the most luxurious temporary home in one of these amazing locations. Athens is the best-known city in Greece, but for many travelers it is little more than a transit between home and Mykonos. And, if you're in the mood for a vacation on the beach, with parties every night, Athens is not for you. Not this time, at least. However, for those whose ideal trip brings them closer to history, while letting them experience the modernity that stems from it, Athens is a dream. Today’s Greek culture (and Western culture in general) is an indelible offshoot from Athenian history. Visiting Athens is therefore like a trip between millennia. Living history that does not require hard work, study, or a forced perspective to appreciate. It’s a bustling city that welcomes tourists and gives you plenty to do, all day and night. Spending a luxury holiday in Athens, even if it’s only part of your trip, is well worth it. A word to the wise – don’t go at the peak of summer. The heat gets a bit much and locals leave for their own vacations. Santorini is a name that is synonymous with luxury vacations. The centrepiece, of course, is its famous volcano. Its 16th Century eruption forever changed the landscape, but what was once devastation has never been more picturesque. Stay on the edge of the caldera (crater) and wake up to stunning views like nothing you've seen before. There’s no need for you to overexert yourself to see the sites. They're right there, as they have been for centuries, and form the perfect backdrop to your holiday. Don't fear the volcano – it’s the least of things to worry about in this day and age! It’s a natural wonder, and one you've got to experience. 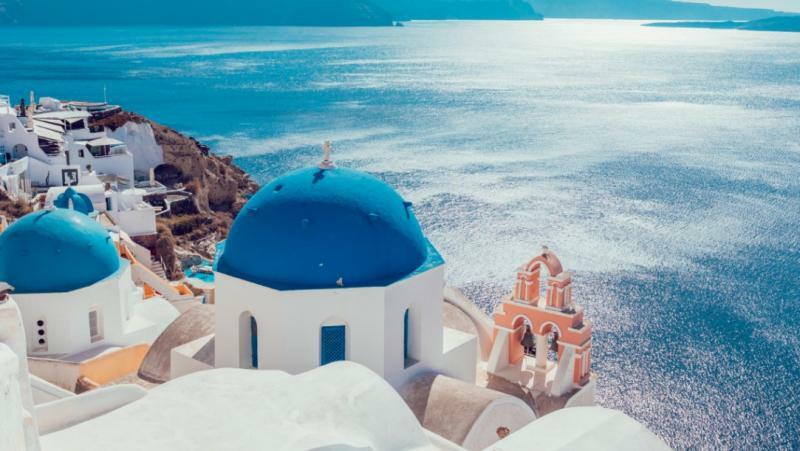 Once we’re mentioning Santorini, Mykonos inevitably follows. One of the party capitals of the world, as well as a favourite destination for the rich and famous, it provides beauty left, right, and centre. Take a trip to Little Venice, or simply spend the day on the beach. The energy is non-stop, and even if you prefer the quiet lap of waves to a beach party, Mykonos’ charm will seduce you. You'll enjoy yourself like you did ten years ago, and by the time you leave you will feel rejuvenated and full of energy. Younger people absolutely eat Mykonos up, but there’s something for all ages. After all, you don’t have to be young to party like it’s the 60’s. If you're single, you'll love the potential for romance. If you're taken, you'll certainly see that potential play out! Crete is Greece’s largest island, which means two things. Firstly, it’s a crucial part of your Greece trip. Secondly, you'll be coming back for more. Crete is the epitome of what people think of when they imagine the splendour of Greece. If you love beaches, there are more than you'll ever find time to explore. If you love history, archaeological wonders await. Visit the Heraklion Archaeological Museum, one of the most important in Europe. It’s home to the ancient Minoan civilisation, with a huge collection of art and cultural artifacts. If that’s not enough for you, the Archaeological Museum of Chania will surely satiate your hunger. Lovers of ancient ruins, rejoice! The Palace of Malia is truly ancient, dating back to 1900 BC. Of course, it was destroyed a couple of times by earthquakes, but even its most recent iteration dates to long before the origins of most modern religions. The more famous Palace of Knossos is likely to be on your itinerary as well, and is fascinating. Find out how Minoan society lived, see examples of their technology, and get a taste for grandness! Finally, spend a week or two in the location that the ancient Romans saw as the ideal vacation spot. Nothing has changed – well, a lot has changed, but not Corfu’s place in culture as the perfect way to spend a luxury holiday. Homer’s Phaeacians lived there (if that interests you), and the town itself is quaint and endearing. You won’t regret visiting Corfu, but you will regret leaving it. Make sure that it’s not just an item to tick off your list. While there’s not as much to do there as Crete, that doesn't mean you should take it off your bucket list.